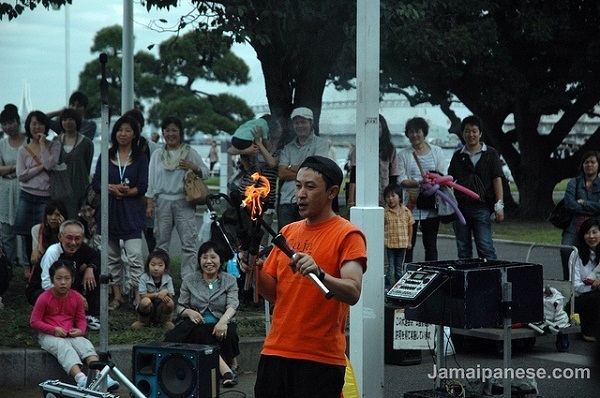 Street performers are everywhere in Japan – everything from stunt cyclists and clowns to musicians covering everything from reggae to hip hop. While in Japan last September there was a national holiday, I think it was “Respect-for-the-Aged Day”. My Jamaica friend living in Japan had the day off from work so we decided to check out downtown Yokohama. We walked all over and checked out the Yokohama Waterfront, Minato Mirai and Chinatown (more to come in a future post) among other attractions. We also ran into a very entertaining magician called “Kaja”, or a least that was what I saw printed on his jacket and props. He was busy performing a myriad of tricks for the crowds involving juggling, fire and of course illusions. Although I couldn’t understand what he said in Japanese he was quite entertaining. I recorded a section of his performance, check out the video embedded below if you are a fan of such things. This brings back memories… we saw a similar thing last trip to Yokohama, but at night-time. I’m assuming it’s a semi-regular thing down there (though we watched the performance at Minato Mirai 21, which definitely is one of my favourite places to visit. And you’re right, you don’t need to know the lingo particularly well to enjoy street-performance (though it helps to get some of the jokes of course). Thanks for the post!